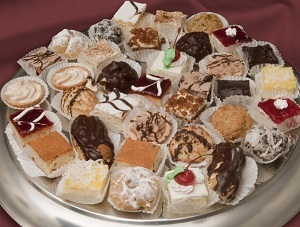 Assorted Mini Pastries | Baker's Perfection, Inc. Carrot Cake Square - Carrot cake iced with cream cheese and topped with carrot cake crumbs. Cannoli Puff - Puff pastry filled with cannoli cream and topped with powdered sugar. Capuccino Square - Vanilla cake iced with cappuccino mousse and topped with cocoa powder. Chocolate Covered Cream Puff - Cream puff filled with custard and topped with chocolate. Chocolate Mousse Tart - Tart shell filled with chocolate mousse and drizzled with chocolate. Chocolate Square - Chocolate cake iced with chocolate butter cream and topped with chocolate drizzle. Chocolate Topped Eclair - Eclair filled with vanilla custard and dipped in chocolate. Coconut Macaroon - A mound of coconut drizzled with chocolate. Fudge Brownie - A brownie iced with chocolate fudge. Lemon Coconut Square - Vanilla cake topped with lemon preserves and coconut shavings. Lemon Meringue Tart - Tart shell filled with lemon preserves and topped with meringue. Lemon Mousse Tart - Tart shell filled with lemon mousse and drizzled with chocolate. Napoleon - Two layers of puff pastry filled with custard and iced with chocolate and fondant. Raspberry Ecstasy - Linzer tart crust filled with chopped almonds, topped with raspberry preserves and decorated with elegant white stripes. Raspberry Square - Vanilla cake iced with raspberry preserves and topped with a vanilla butter cream dollop. Red Velvet Cake Square - Red velvet cake iced with cream cheese and topped with red velvet cake crumbs. Rum Ball - Chocolate fudge that is soaked in rum flavor and rolled in coconut. Vanilla Square - Vanilla cake iced with vanilla butter cream and topped with a cherry.